Starting a new hydroponic project? Or want to upgrade your existing system? You might want to start with the grow lights. As one of, if not the most important part of the hydroponic system, having a proper and sufficient grow light can dramatically improve the quality of your system, increasing cost efficiency, and promoting better yields. Among LED Grow Plant Light , Galaxyhydro 300w LED because it’s a reputable company dedicated to the research and product developments surrounding the emerging hydroponic industry. 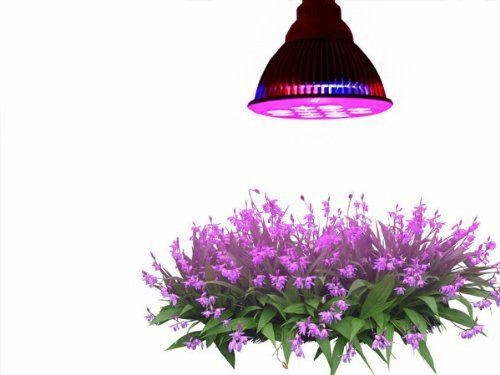 Their 300W LED Grow Plant Light product deemed a special mention of being a 9-band color spectrum grow light with a best-seller status in many marketplaces. Among LED Grow Plant Light,TaoTronics LED light is one of the most reputable brands for grow light products available on the market. TaoTronics’ grow light products have been some of the best-selling products on many marketplaces, and the TT-GL22 is one of their most popular items. Grow lights came in different types, with wide varieties of brands, wattage ratings, and overall quality. Different plant varieties might need different types of grow lights, and might need different color spectrums to achieve optimal growth. Different growth stages of plants will also need different grow lights, over complicating the selection process. Therefore, we decided to compile a guide to help you make your purchase decision, where we will discuss the most popular products available on the market, and do a thorough review of each. With grow lights being so important in improving the overall quality and efficiency of the hydroponic system, we will try to help you make a better purchase decision that will cater to your specific needs. Before I fell in love with hydroponics and gardening in general, I was a small business consultant as well as the active CTO of a tech startup. Understanding technologies and science like a bread and butter, and being passionate with how a plant can grow and nurture, my aim is to bring the technical knowledge decisions as comprehensive as possible so that every Hydroponic enthusiasts can make the best purchase decision possible. In conclusion, fluorescent light (T5, CFL, etc.) is an economic choice that can be used in tight spaces. However, overall yield is not efficient compared to other types. TaoTronics Led light Bulb is Long lifetime expectancy of over 50,000 hours. TaoTronics is one of the most reputable brands for grow light products available on the market. 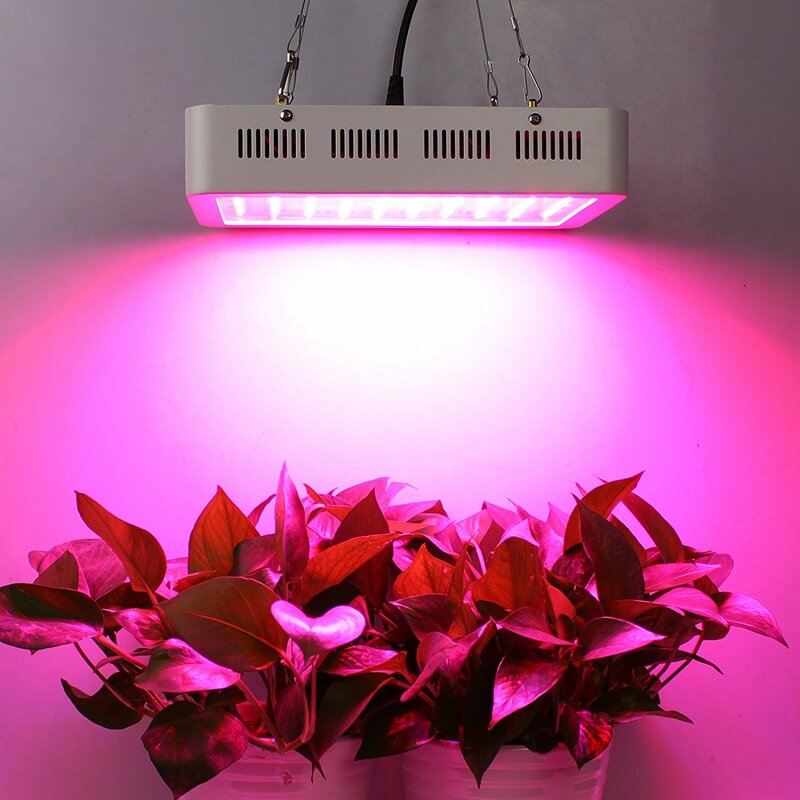 TaoTronics’ grow light products have been some of the best-selling products on many marketplaces, and the TT-GL22 is one of their most popular items. 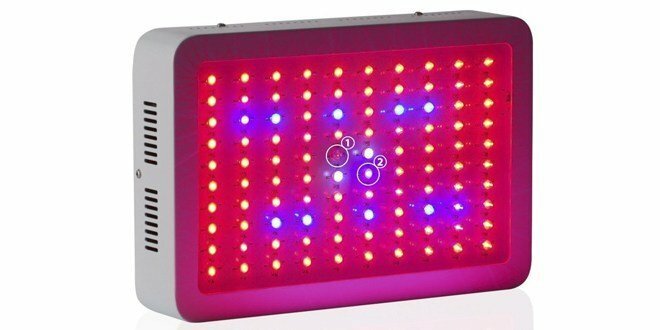 The 24 Watt grow light comes with twelve 2W LEDs, with 3 bands of color spectrums of reds (630 and 660 nanometers), and blue (430 nanometers) which have been suggested as the most optimal spectrums for plant growths. -LEDs, however, tend to need more space between the lamp and the plants. Being of a smaller LED, you can space the TaoTronics TT-GL22 18 inches or more from the plants. The TaoTronics TT-GL22 is more suitable for flowering and fruit periods. Another one from TaoTronics from the same line of products. The TT-GL20 is very similar to the TT-GL22 we discussed earlier, with the main difference being its 12W power instead of 24W. With ‘only’ 12 Watts power usage, the TT-GL20 also utilized 12 LEDs, with 1W power for each. With similar color spectrums to those of TT-GL22 (630 and 660 nm reds and 430 nm blue), the TT-GL20 might be your best choice if you are looking for a smaller wattage grow light. With two bands of red spectrum wavelengths, the TaoTronics TT-GL22 is more suitable for flowering and fruit periods. The Erligpowht LED Panel can be used for wide range of plants and growth stages. Erligpowht LED Panel is a popular choice for indoor grow light, and with its reasons. Being relatively cheap, highly efficient, and satisfactory yield per wattage, Erlighpowht remains one of the best choices for indoor LED grow light. The product is widely used in plant factories, greenhouses, indoor farms, and tissue culture facilities as well as many others, and is suitable for wide selection of plants such as herbs, lettuce, grapes, tomatoes, bananas, vegetables such as seaweeds, green peppers and gourd, as well as flowery plants like orchids. Consists of 165 red LEDs of 650nm wavelength and 60 blue LEDs with 465 nm wavelength, totaling of 225 LEDs with 45 Watts of total energy. Commonly used with rope hangers, as well as a programmable timer. Can combine with grow lights with green and white color spectrums for better results. Being of a LED type, will need spacing between the light itself and the plants, recommended space is 18″ or more. One of the most affordable products, especially being full-spectrum. 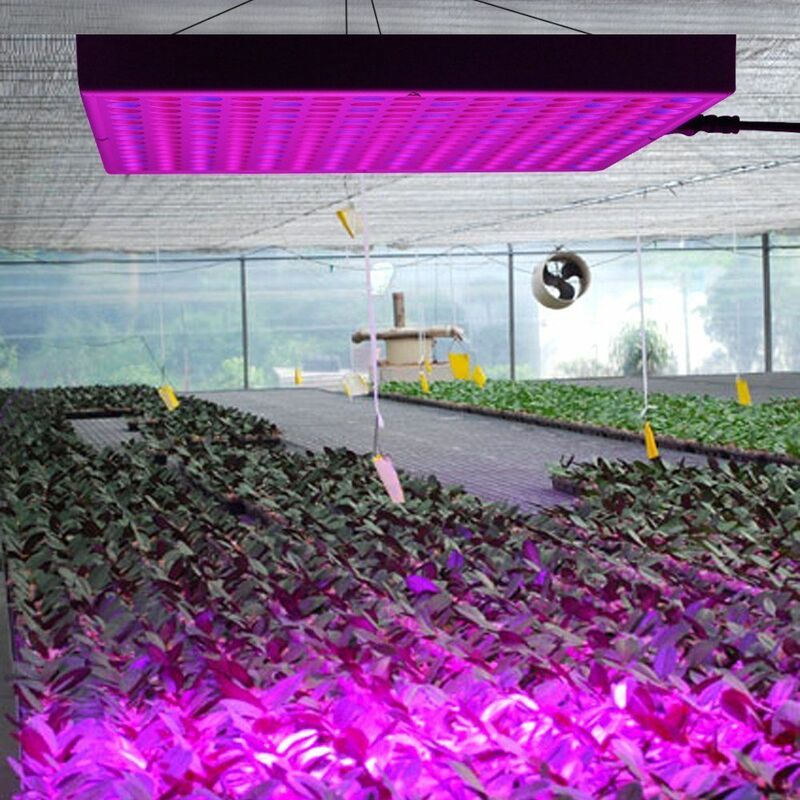 The Morsen full spectrum LED, as the name suggests, offers full-spectrum color LEDs to cover a wide selection of plants as well as growth stages. This feature makes the Morsen Full Spectrum LED a popular choice, especially for low-wattage applications. However, having a full-color spectrum is not its only great feature. The Morsen full spectrum LED grow light is famous for its efficiency, easy installation, and effective yield production by being one of the most affordable products on the market. With full-color spectrums, you can apply this grow light to wide varieties of plants, as well as different growth stages. This grow light can cover 9 sq ft (3'x3') of growing area, with a recommended coverage being 2'x2'. Viparspectra’s 300W Reflector-Series LED Grow Light is a widely successful grow light, especially for the above 100W class. Covering full-color spectrums, high lumen output and wide light coverage area, the product can cover both vegetative and flowering stages of plant growth by closely imitating true sunlight. 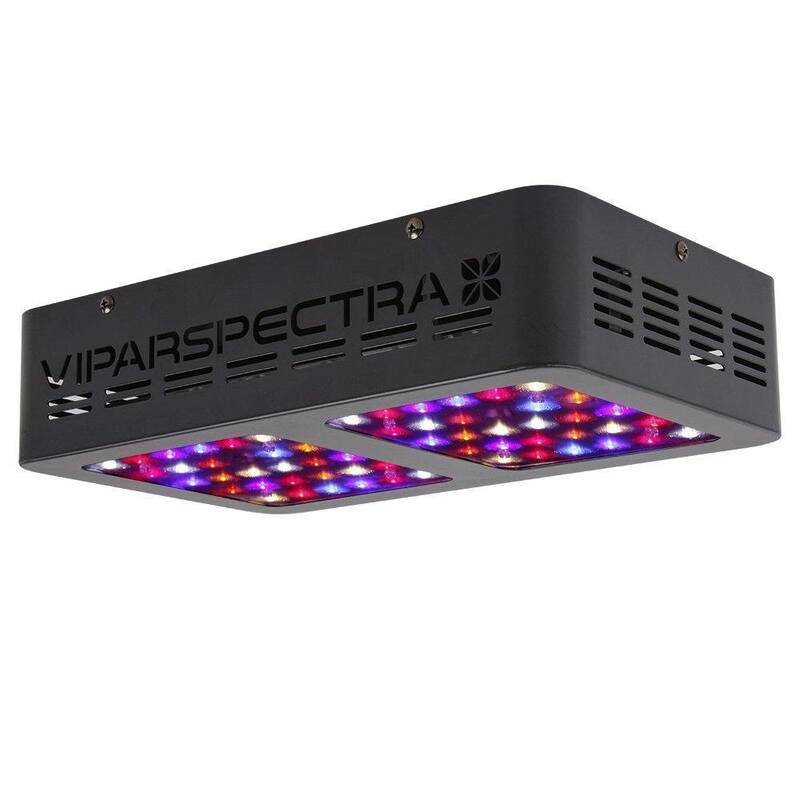 With its built-in 4,72″ cooling fans and heat sinks, the Viparspectra 300W grow light also has a great heat dissipation feature, maintaining cool temperature during use which is highly important to maintain plant’s health. The Viparspectra 300W LED’s performance can compare to a 250W HID lamps, despite ‘only’ using an active wattage of 136 watts. With full-color spectrums covered, this product can be used for many types of plants at different grow stages, and you most likely won’t need to complement it with another product. Galaxyhydro is a reputable company dedicated to the research and product developments surrounding the emerging hydroponic industry. 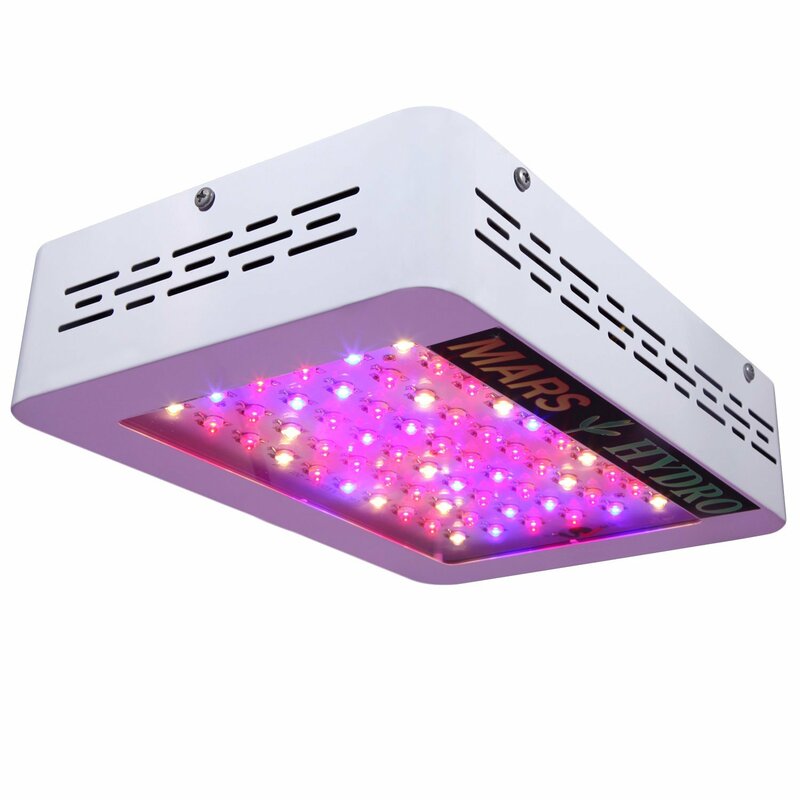 Their 300W LED Grow Plant Light product deemed a special mention of being a 9-band color spectrum grow light with a best-seller status in many marketplaces. Covering almost all of the essential color spectrums for healthy plant growth with 100 pieces of LED, the Galaxyhydro LED Grow Plant Light can cover many different kinds of plants from vegetables to fruits to flowers, and can be utilized in all growth stages from germination to vegetative to flowering stage. The product came with its built-in cooling system, and can maintain low temperature even after long usage. Actual power is 145W, which is quite efficient compared to its competitors. Height and spacing requirements can limit its application, needing up to 48″ of height. The built-in cooling fans are relatively loud during usage. One of the most High power efficiency and energy saving products on the market. MarsHydro is one of the most reliable brands for hydroponic lighting. With almost a decade of experience, their products are some of the most popular choices for hydroponic enthusiasts and industry practitioners. The Mars300 is one of the best selling grow lights in 300W range, and not without its reasons. Covering red, white, and blue spectrums, the product is one of the best choices for vegetative and flowering stages. One of the few products available with UL-safety certifications, the product is very durable and reliable, while maintaining great power efficiency and yields. Red, blue, and white spectrums, perfect for both vegetative and flowering stage. Very durable and reliable with rigid construction. 1-year warranty with 30-day return policy. High power efficiency and energy saving. UL-safety certified, zero risks of catching fire. Lifetime expectancy of up to 100,000 hours. One of the most affordable 300W-rated products on the market. Actual wattage is ‘only’ 132 Watts. Might need supplemental lighting to cover green spectrum, as well as infrared and ultraviolet lights. Height and spacing requirements might limit its applications. Maximum coverage area of ‘only’ 2’x2′ is less than its competitors. 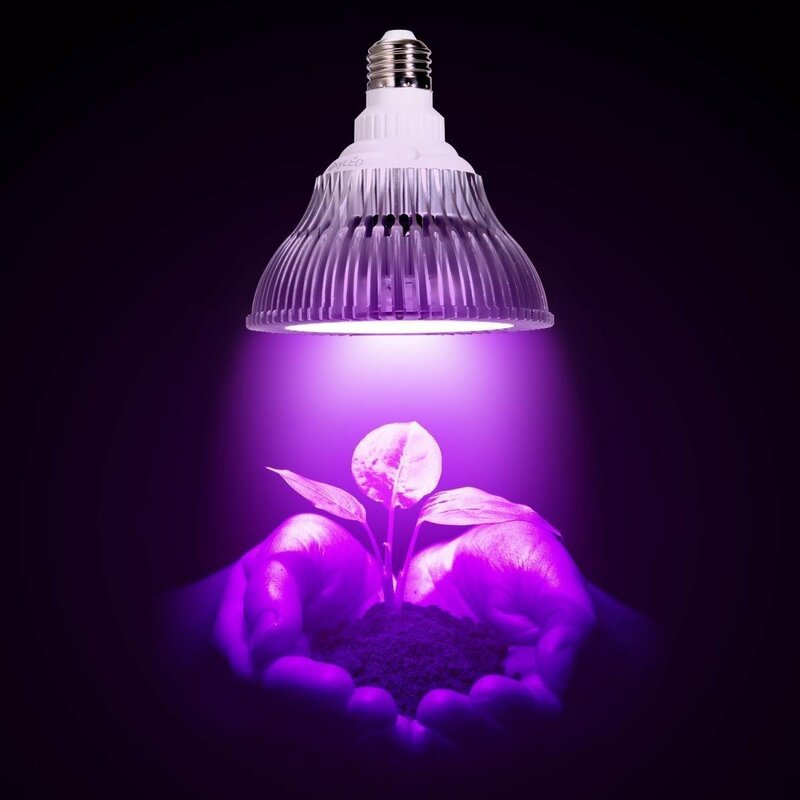 This LED Grow Light Bulb Built-in heatsink, maintaining cool temperature during long usage. If you are looking for an affordable grow light especially for small hydroponic projects, the OxyLED is one of the most affordable options you can get. 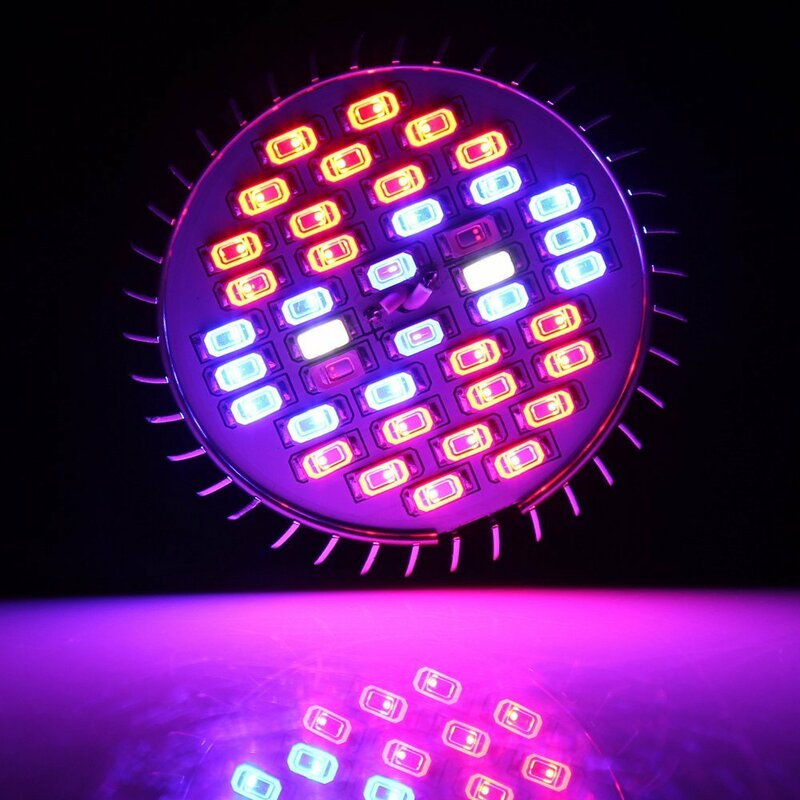 However, being cheap doesn’t necessarily mean it compromised the overall quality.The OxyLED Grow Light Bulb is highly efficient and came with 3 blue LEDs and 9 red ones, covering the red and blue color spectrums needed for plants’ healthy growth. 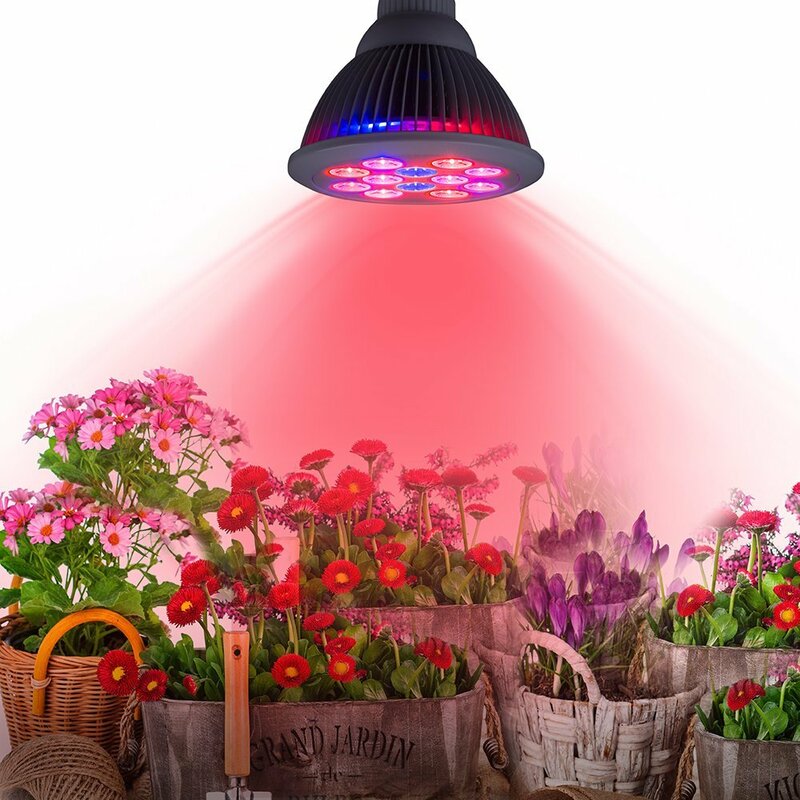 With focused spectrums of red and blue, the OxyLED is effective for leaf and fruit plants and can assist the photosynthesis process to promote healthy growth. Being of 12W in power wattage, the product is best utilized for small plants or small projects. The overall wattage usage and yield per watt are some of the most important considerations you might have, especially if you are running a commercial hydroponic farm. Consider whether the size of your grow area fits the wattage requirement of your selected grow light. Different plants and different growth stages might need different color spectrums to achieve optimal growth. Make sure that your color spectrums match your crops’ needs. If you are using grow lights that will generate heat over time, you might need to build an additional heat ventilation system. With the actual wattage of 145W, great yield/watt, and high overall efficiency, the Galaxyhydro LED Grow Plant is the best choice for an efficient hydroponic system. Very cheap, but not of a cheap quality. High energy efficiency, red and blue color spectrums for a wide range of applications, and great overall performance. The Galaxyhydro LED Grow Plant Light is not only power efficient, it’s also competitively priced, generating great yield per watt performance, and can cover full 9 band spectrums for a wide variety of applications.